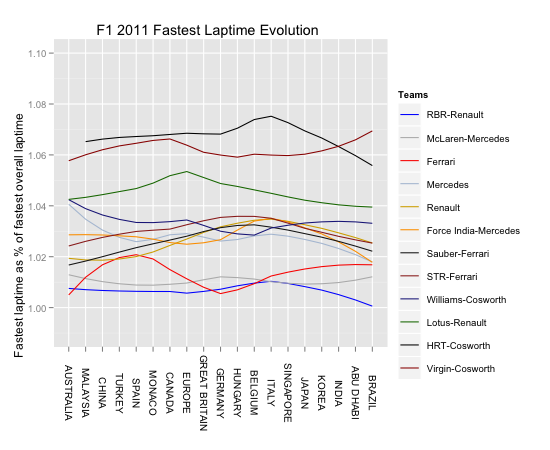 Prompted by a comment from @sidepodcast, I thought I'd try to come up with some ways of tracking how the teams made progress over the course of 2011. 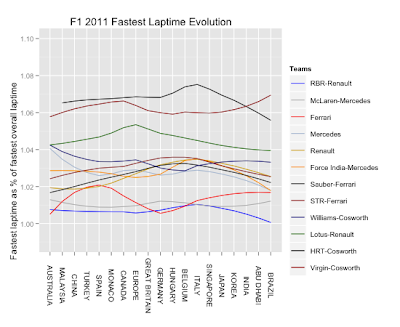 This is still a work in progress, but here are some early thoughts based on fastest lap time recorded by the teams in each car recorded across the season. 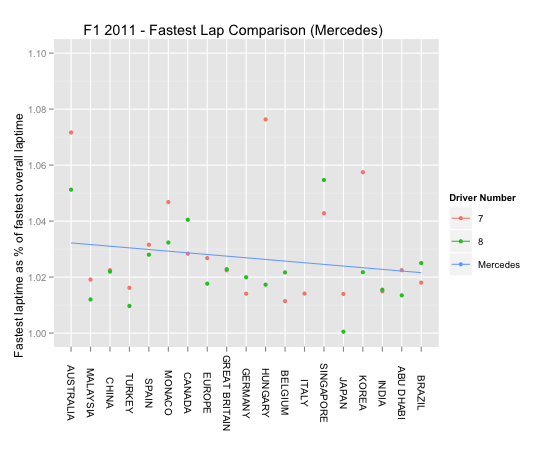 The fastest car thus has scaled laptime of 1.0, and slower cars have a scaled laptime of greater than 1. Looking at these times, we see that Mercedes appeared to be off the pace compared to the fastest lapping car in Australia, had a reasonable run from Malaysia to Turkey, fell back in Spain but then steadily improved (relative to the fastest lapping car) in the run through to Japan (with a blip in Singapore), then fell back but held steady over the last four races. 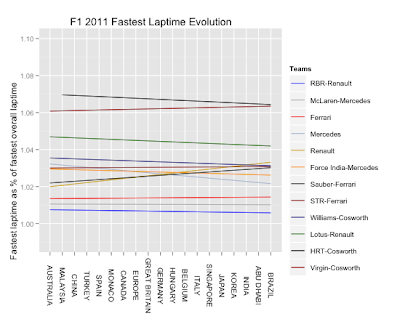 See also: F1 2011 Review - Another Look at Fastest Laptime Evolution for an improved chart that plots the fastest laptime recorded by each team for each race. Note: whilst I was collecting timing data over the course of the year, I cheated for this post and grabbed the data from the formula1.com results pages. Here's the Python script I used to scrape the data (data as a spreadsheet). Hmm... 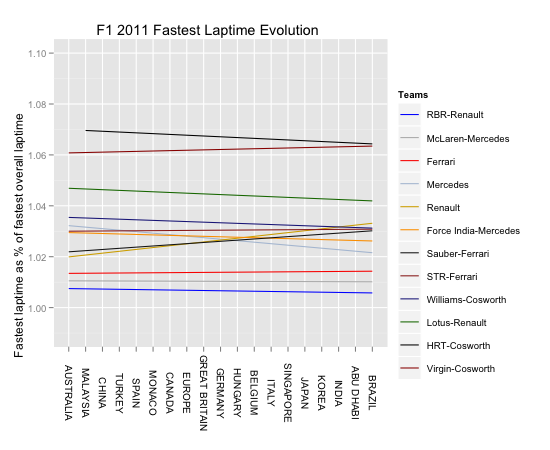 I wonder if, on the x-axis, i should space the races out according to week number, as a way of trying to distinguish between back to back races and races with rather more development time between them? A couple more commands that may or may not be useful. 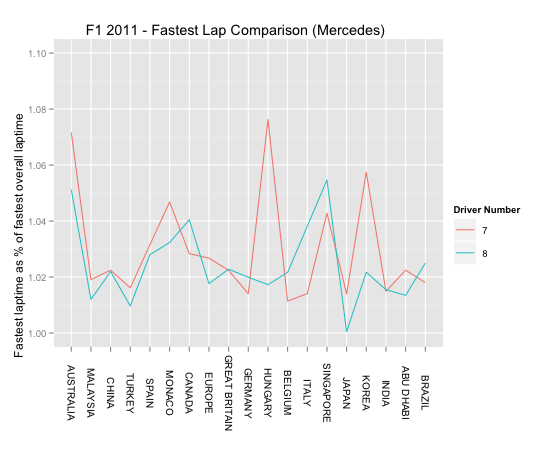 #I'm not sure how to use this data though? Looking at the traces for all the teams on a single ggplot chart can at times be confusing. To split the traces out into a separate panel for each team, we can just add "+ facet_wrap(~team)" to the ggplot command.